Isn't butternut squash difficult to cut? I like to buy it already prepared for roasting. We've been eating a lot of oven roasted veggies. Delish! I finished a pair of thick socks (you've seen them before - in progress). 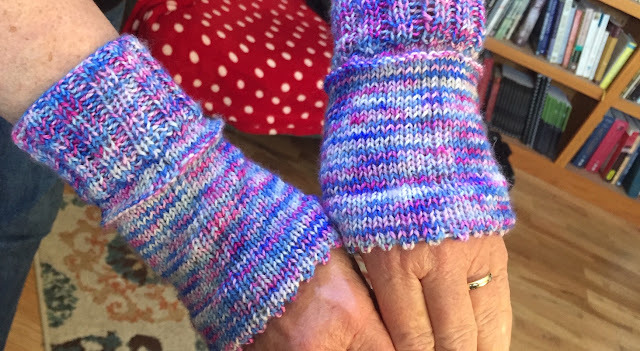 I finished this pair of wrist warmers before I left for Washington. I love them. I watch a YouTube vlog called Tales From Cuckoo Land. She's so fun to listen to. She's an English mama and a maker of lovely things. She decided because December was so busy at her house that she would designate January as a very cozy time. January sped by for me, but I am trying to keep February peaceful and home-y. I've moved things around, tidied surfaces, lit candles, made coffee and tea, read good books, knitted and ironed. I've even done a little organizing. Our Kelli has a lot of pets at her house (if you remember). Well, here are two new members of the pet squad. 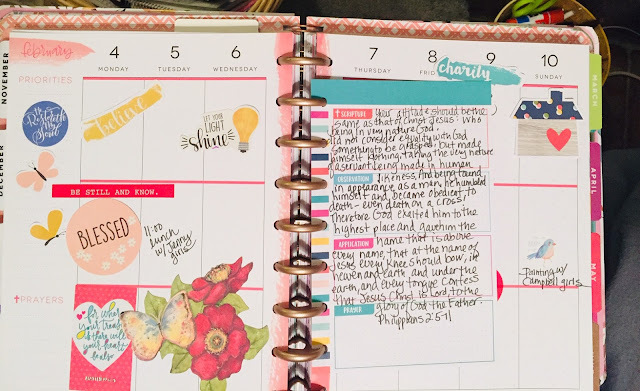 I'm still enjoying using my planners. I do my own thing. It's cold. Timothy must find warm places to snuggle. I try to stay up a little later each evening, but our bed beckons and soon I am snuggled under the covers. We've had the humidifier going nonstop and I have been wearing my slippers a lot. Winter is like that, you know. I'm re-reading A Circle of Quiet. It's a very inspiring book. I am rearranging my office so I can use the computer in there AND get cozy with most of my books. It's a little bit like a rat's nest, so I have small plans for clearing some of the "junk" away. We'll see. I have been huddling close to the space heater and sitting on a heated blanket. It's that cold. Soon the sun will move and the sunshine will make our house warm again. I'm so thankful for a cozy house, a sweet and attentive husband, kids who love us, grandchildren that grow my heart, and friends and neighbors. Oh! And my family in Washington. They are all so very dear to me. I bought a new gratitude journal. It's pink. I'll take a photo of it next time. What are you thankful for right now? My dear friend Lori just became a grandmother. When I met her she was in high school (forty years ago). Now she is married and has a family. She is a teacher and A GRANNY. I'm so happy for her. She's one of those kindred spirits that stuck in my heart. You know the type, right? Thank you for reading, kind person. Welcome back home, Pom! It's good to see you snuggled up with your yarn and your cat again :) Yes, December was a whirlwind. January has been pretty good for us thought. I've tried, as much as I could, to stay home. 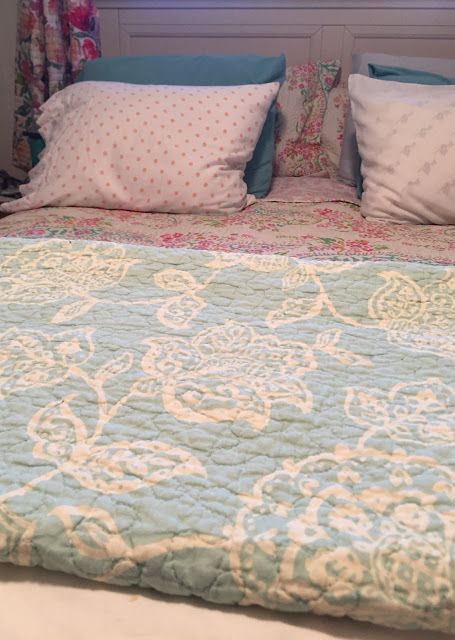 It's been so warm this week my inner girl is feeling very much like it's spring and spring-cleaning time! Yikes! Keep warm out there. Your socks and smittens look so good! I love grilled veggies of all kinds. 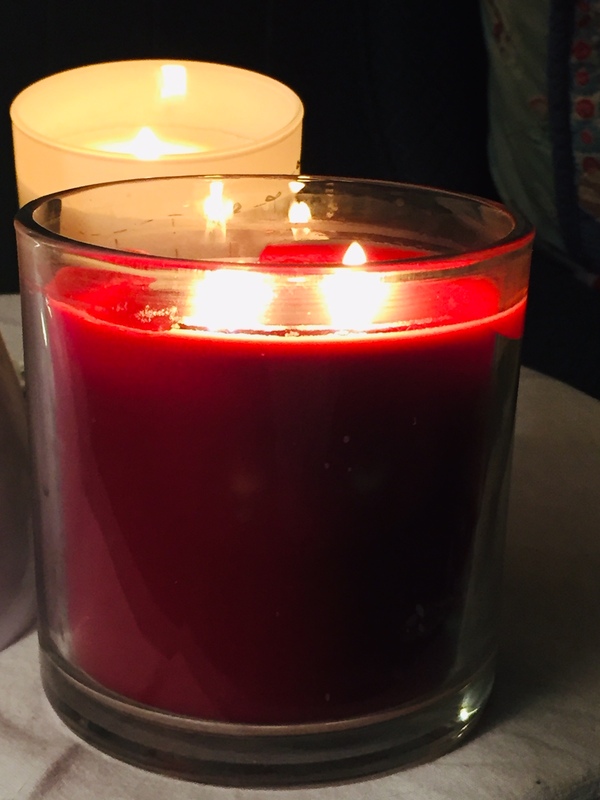 Everything comes up cozy at your place, even the animals look cozy and you with those warm socks and wrist warmers and the warmth of the candle glowing. Our place is big but we have two wood stoves to help keep it toasty, although, wood makes a mess, it's the price we pay for comfort. Our winter has been cold, very cold, and anything in between. This week has been warmer for a change. I love all of those bright colors you surround yourself with. I love your sock and how cozy everything looks. Your bed does look comfy. Have a wonderful Saturday and weekend. Cute bunnies. It's very cold here too and I'm wearing two pairs of socks to keep cozy. Your knitted socks look very comfy. I'm so glad you mentioned The Circle of Quiet. It took some looking but I found my much-read falling apart copy and tomorrow I'll begin to reread it again. I've been reorganizing my bookshelves ( no more space for more) and actually managed to put maybe 8 or 9 in the 'donate' box. Nice wrist warmers and socks! And I buy pre-cut squash too. Some stuff I don't mind cutting but that's a huge pain. Hi, Tim! You look purrfectly divine! Love roasting veggies, too. That very same combination. :) I like to buy the butternut squash already cut up, too. It certainly is cozy wear and slipper time. We continue in the teens today. The west side of the state is getting slammed. They've closed I-90 at Vantage today. Hope you have a comfy cozy weekend. Those knitted socks look very cozy and warm. It's really cold here too and I'm keeping the fire stoked in the stove and am wearing slippers too. I can't bear walking around the house without them. We've been below zero for several days and it makes everything cold and colder. Lambies are arriving so we go check them all the time around the clock. I am thankful for a warm home to come in to from the cold. Right now I'm thankful that my bread loaves rose enough to put them in the oven in the morning; I didn't have to wait on them until evening and wonder if they would keep me up late! Oh those socks look so toasty warm. Cold here again today but at least the sun is shining. I'm so thankful for this house in the woods. How blessed we are!!! I've never tried butternut squash, but that dish sure looks good. Your home is always cozy and warm looking. So inviting. I love a little rat's nest. My sewing room looks a lot like one. In fact, the whole house does. Keep warm. Love your socks and wrist warmers! So pretty :-) Timothy is adorable, reminds me of our 2 cats always looking for a comfy spot to curl up in. They particularly enjoy our sunroom. :-) I love planners and journals as well and it's always best just being totally creative with them :-) Hope you enjoy the rest of your weekend. I'll have to look for pre-cut butternut squash. Trying to cut it up is what keeps me from eating it very often. When I do make it I usually poke a few holes in it, put it in the oven until it softens enough to cut, then just cut it in half, scoop out seeds and continue baking until it's done. A lot of fiddling! Do you know that COSY is the word I think of every time I read your blog. You are a very cosy person and I think that is why you are so beloved of your family- you exude love, safety, warmth, gratitude and contentment- it is very lovely to read. I seem to live in our kitchen as the underfloor heating is so warm in here- it doesn't seem to be working in the lounge so I don't really go in there! Pity as the sofa is more comfy than these kitchen chairs! I agree that Butternut squashes ARE hard to cut though some are worse than others- the last one I had was really easy to cut but the one before that was super difficult. I still don't want to buy them ready cut up though because of the plastic packaging which is damaging to the environment- so much food comes in plastic- I find it very difficult, particularly as we are reaching crisis point with it in the ecosystems. Thus, I will persevere with the pesky vegetablees!! Your handwarmers are beautiful- you are clever to have made them so beautifully AND the socks.